Home » Compression » Choosing the best knee support for you! Whether you are new to exercise, or an old hand, every now and then you will feel a twinge or mild pain in the knee. Nearly all the time this is perfectly normal and will (with a little care- possibly from a good knee support) go away by itself. However if, even taking it easy or using support you still feel more than mild or moderate pain then you should consult professional help! With that caveat aside lets take a look the best Knee Supports. How does the knee work and where does the pain come from? First though we should take a little time to understand what the knee is and what it does. The body is a fascinating machine, and the knee is no different. Your knee is designed to support the weight of your whole body while running at speed. The impact of your legs hitting the ground while you run is like a blow from a heavy weight boxer! Yet the knee can store up this energy and spring it back with terrific force to propel us forward. They can do this again and again, mile after mile. If its not your knee thats the problem, maybe you need to consider more calf support? To keep the movement fluid there is a net work of ligaments (strong flexible tissue that joins bones to bones in the body) that are well designed to control the movement of the two big sets of bones in your leg, the femur in your thigh, and the tibia/fibia of the lower leg. Its these ligaments that we are particularly interested in, because in most cases its the ligaments that cause the pain. You can think of a ligament as a strong rope that has very little stretch, but is incredibly strong. 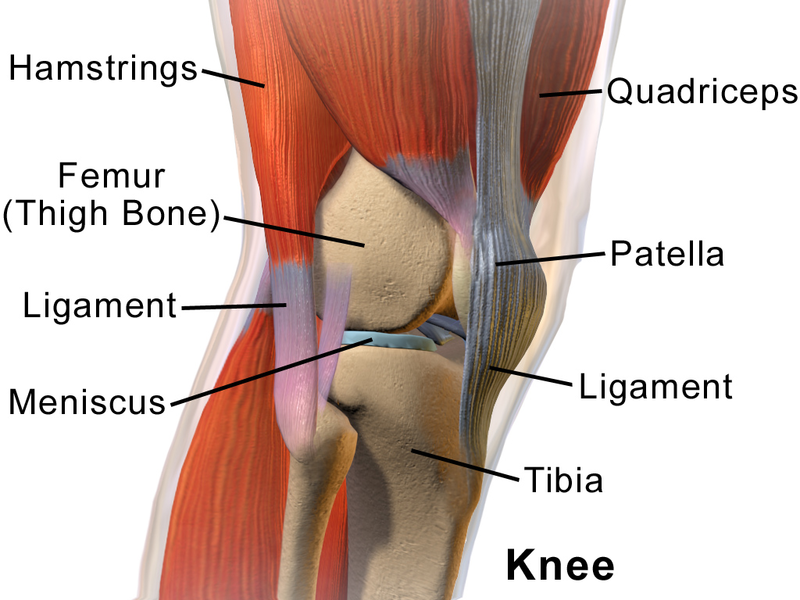 The two most common injuries for the knee is either a small tear in the meniscus or ligament, or inflammation. Best Knee support for Inflammation of the knee. Inflammation of the knee can be incredibly sore and disabilitating. Fortunately though it can normally sort its self out with a little care and attention. The best advice for an inflamed knee is to first take the weight off the joint, elevate the knee and add ice. This will bring down any swelling. after a little rest then the best thing to do is support the knee with compression. Depending on how inflamed your knee is, and how careful you will be when exercising will decide how much support is needed. Walking or light jogging will need less than intense running or cycling. Prevention is better than curing knee injury! If you want to avoid knee injury, or you know that you are susceptible to knee injuries then you might want to consider some best ways of preventing knee injuries. Our favourite choice is KT tape. This stuff is next to magic in how good it is. We use this all the time in the gym for strapping up people recovering from injury or looking to prevent injury. When I go for a competitive 10km run I will see plenty of runners using the KT TAPE Original, or Kinesiology Therapeutic Tape, this short video shows how easy it is to use. What I like about it is that its light weight and comfortable (plus there is a huge number of colours). The downside of course is ripping it off once you are done! Still its much less painful than an aggravating knee injury. Our best choice for a Knee Support Tape is the KT TAPE Original while other tapes are available, we like the brand leader. Their videos show clearly how to use it, how best to apply and ensure that you are using it right every time. There are plenty of cheap rip offs, but we have always found them to be lacking in quality, either they are to sticky and are impossible to remove, or they are not sticky enough and come off half way through the run!